THIS IS TRUELY LIVING! This home is bursting with spectacular views that will renew your soul. 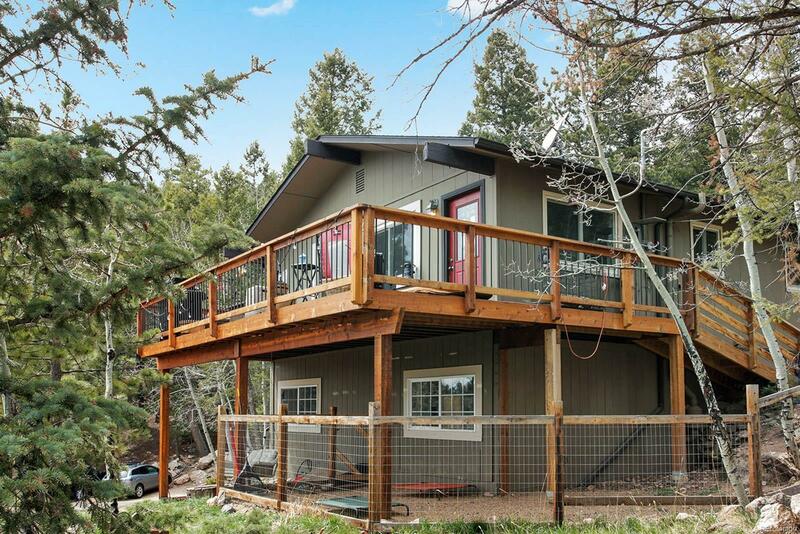 Enjoy sitting outdoors on your flagstone patio with rock outcroppings and mature ponderosas or barbecuing on your oversized deck. You will never want to leave home. This 3 BR, 3 BA home features a Master Bedroom En-suite with Walk-in Closet, NEW Windows, NEW Fenced Dog Run off of Deck, NEW Propane Fireplace Stove, NEW Hail Resistant Roof and NEW laminate "Wood Looking" Floors. The kitchen has granite counter tops, custom backsplash and features a wine cooler. The lower level features a family room, 1/2 bath, laundry room, 3rd bedroom, mudroom and attached 2 car garage. This home has the Most AMAZING Dog Run! Your pups will love it! You also have a paved south facing driveway (a must have) w/ample parking for guests, extra cars or toys. Easy commute... HWY 285 is only 1 mile away, South/West Denver is only a 15 min drive. Hurry, this won't last long. Priced to sell!